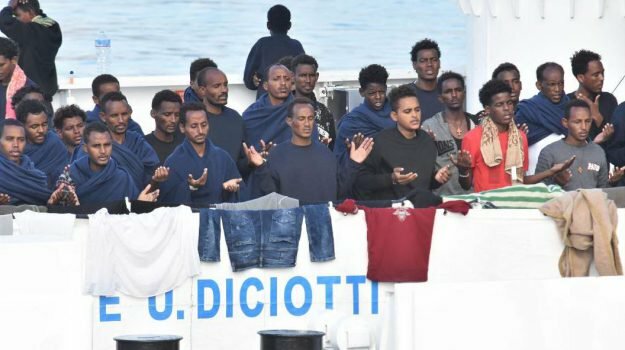 Italy, August 25: Some 150 refugees stuck on board the coast guard ship Diciotti in the Sicilian port of Catania have started a hunger strike. They are blocked from disembarking by the Italian government. They have been in the port for the last five days. The Italian government is demanding that other European nations take in the people aboard the vessel. According to human rights lawyers, Italy’s Interior Minister Matteo Salvini, who ordered the asylum seekers to be kept aboard the vessel, is breaking international laws. Salvini is a strongly anti-immigration politician who has vowed to stop refugees from entering Italy, and to deport 500 thousand people who already live in the country. Since June, he has blocked a number of humanitarian ships from bringing people rescued from the sea to Italy. The people rescued by Diciotti’s crew from a sinking trafficker’s boat, have spent a total of 9 days onboard the ship. Many are saying that they have been subjected to inhumane treatment and torture for months, or in some cases years, in Libya. All but 18 are Eritrean, the others are citizens of Somalia, Syria and Sudan. About eleven are women. Earlier this week, 40 young children and minors were evacuated from the ship. On Friday, advisors from 12 EU countries, including Italy, met in Brussels to discuss refugee crisis in Europe, including the situation of the people stuck on Diciotti. When it ended, Italian Prime Minister Giuseppe Conte commented that no progress was made.